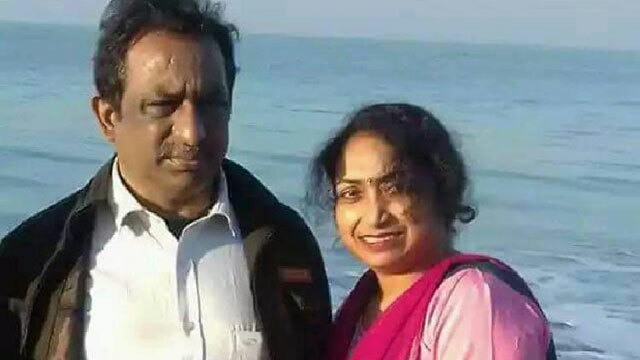 Dhaka, Apr 4 (Just News): The extramarital affair of Rangpur public prosecutor (PP) Rathish Chandra Bhoumik’s wife was the reason behind his murder. Rapid Action Battalion (RAB) director general Benazir Ahmed said this at a press briefing at RAB-13 Headquarters in Rangpur on Wednesday. Rathish’s wife Snigdha Sarker confessed to RAB that she had an extramarital affair with her colleague Kamrul Islam and they planned to murder Rathish two months ago. Both Snigdha and Kamrul are teachers of Tajhaat High School of Rangpur. Rathish was killed on Thursday night. He was first made unconscious as 10 sedative pills were mixed with his food. They then strangled him to death, Benazir said quoting Snigdha's confessional statement. The body was then left at the basement of an under-construction building in Mollahat area of Tajhaat with the help of two youths. On Snigdha’s confession, RAB members recovered the body around 2:30am Wednesday, in a drive that started at 8:30pm on Tuesday. The PP’s brother Sushanta Bhoumik identified the body of Rathish. Four including Snigdha and Kamrul have been so far arrested in this connection. Rathish, 55, who represented the state in a case over the killings of Japanese national Hoshi Kunio and Rahmat Ali, khadem (caretaker) of a shrine, went missing on Friday morning.